Available in single-packs too, part number 121 2550. Get the full use of your power strips and UPS outlets with our high-quality Power Strip Liberator® cables. Just plug those big bulky power adapters into our cables and plug the cables into those previously unusable outlets! Have a power cord that just won't reach? Buy a handy 1-foot extension and forget about those long, tangled extension cords. Sold as a five-pack. For indoor use only. Pros: Does as expected. Allows me to plug power adapter boxes into a power strip. Can't ask for anything more. Other Thoughts: I always find use for one of these. If I could have a box with a few hundred of these, I would. 12928 out of 25716 find this review helpful. Cons: Suggest you indicate online and in catalog the Wire Gauge in the descriptions for all liberators (and any other power product). Currently, only the basic liberator states 16 ga and one other says 13 Amps....are they all 16ga? 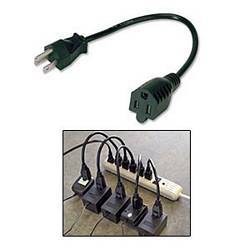 Power strip cords are usually 14ga. We are adding technical information to all the Power Strip Liberator products. This particular product uses 16AWG wire and meets UL 817 specifications for power supply cords. That specification allows for 1625W, or roughly 13 amps at 120 volts. Previous versions of this product were manufactured with 18AWG, but that was now several years ago. Thanks for the suggestion! 12544 out of 24952 find this review helpful. Pros: These just do the job. See the picture? No brainer. They do just that, and are not overpriced. Other Thoughts: They don't have the features that the other ones on the site have. So? If you want a Y or, rotated head or whatever, order the other one! If all you need is to get some plugs out a few inches from a too-small power strip, this will do it. 12260 out of 24532 find this review helpful.